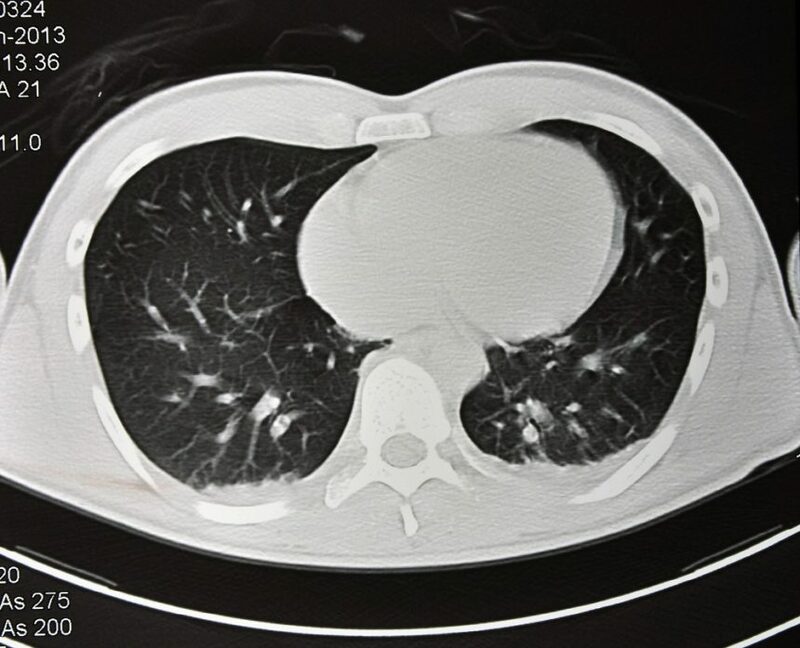 Metric analyses added to CT scans of COPD point to lung-at-risk of disease progression. “It is plausible that emphysema begets more emphysema, as regions of the lung adjacent to emphysematous regions are subject to abnormal forces of stretch during tidal respiration,” wrote Surya P. Bhatt, MD, of the division of pulmonary, allergy, and critical care medicine at the University of Alabama at Birmingham, and colleagues, noting that cyclical breathing imposes additional stress on already weakened elastin and collagen fibers of the surrounding alveolar walls that over time can result in rupture. Decline of lung function is accelerated in people diagnosed with COPD, according to the investigators, at higher rates than rates observed with normal aging. These rates remain high, even after quitting smoking, suggesting that normal-appearing areas of the lung in COPD are at high risk of functional decline. In a multicenter study, investigators compared computed tomography (CT) images of both inspiratory and expiratory lung volume in individuals with COPD (n=680; mean age: 63±8.4). Data were gathered from the Genetic Epidemiology of COPD (COPDGene) study (ClinicalTrials.gov identifier: NCT00608764). Researchers followed participants for 5 years. Disease severity within the cohort (44.9% women; 24.6% black), ranged across Global Initiative for Chronic Obstructive Lung Disease (GOLD) stages I-V (17.6%, 45.3%, 27.9%, and 9.1%, respectively) with a median disease duration of 63 months. All patients had smoked previously; 37.6% were current smokers, with an average of 48.9 smoking pack-years. As GOLD grade increased, researchers saw a progressive decrease in mean Jacobian determinant of voxels with emphysema (P <.001 for overall trend and between-group difference). In a similar fashion, a decrease in normal voxels was seen in conjunction with increasing disease severity (P <.001). Dr Bhatt and colleagues also tested the association between the coefficient of variation of Jacobian determinant and forced expiratory volume in the first second (FEV1); the association was confirmed — including both emphysematous and normal voxels — following both univariate and multivariate analyses (adjusted β: 0.821; 95% CI, 0.364-1.278; P <.001). “This association was mainly seen in participants with GOLD stages I and II, and not in GOLD stages III and IV,” the investigators noted. “Our findings suggest that areas of normal appearing lung are mechanically influenced by emphysematous areas and these regions of lung at-risk is associated with lung function decline, thus providing a novel biomarker for disease progression in COPD that is measurable on clinical CT scans,” the researchers concluded. 3. Maksym GN, Bates JH. A distributed nonlinear model of lung tissue elasticity. J Appl Physiol. 1997;82(1):32-41.